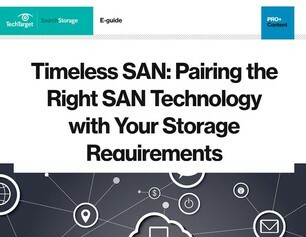 Despite an increasing array of primary storage options—and the hype around them—more than 77% of respondents in a recent SearchStorage.com survey indicate they still rely on SANs to handle their primary storage needs. So, odds are you’re using an external system in your company, too. In light of the hyped-about alternatives (à la hyperconverged and unified systems), you’ll need to ensure your SAN’s expandability delivers the availability, performance, and capacity your company needs—while solving the networking block storage issue. Since you’ll choose between iSCSI and Fibre Channel (FC) protocols during these projects, we’re now offering you access to our e-book Choosing the Right SAN Technology with Your Storage Requirements to fast-track this decision-making. Our team helps you select the right SAN based on your company’s unique requirements. The PDFs are limited so access yours here: https://techtarget.qualtrics.com/jfe/form/SV_a5FIWN7vKB1U1bn.